Make a ceramic planter for spring flowers using coil building techniques, red clay slip, and surface decoration. Draw your inspiration from Lynden’s acres or mementos brought from home. Planters will be fired at Lynden and ready for pick-up in about ten days, or you can join our Spring Sawdust Firing for a subtle, shining finish. Beginners welcome. Katheryn Corbin is a painter, potter, and figure sculptor. Pots and figures have both been a part of Corbin's studio practice and teaching. Drawing and painting are important elements in each discipline, and her clay pieces are informed by the complementary processes of working with clay as vessel and as figure. 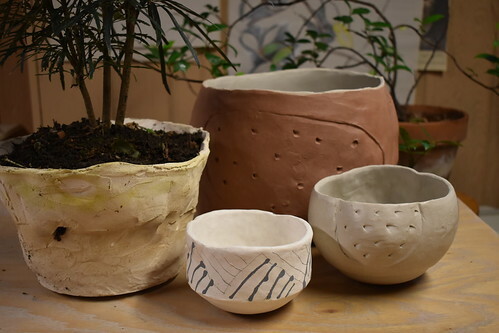 Corbin is interested in historical developments in clay and variations across cultures, and she often explores different firing techniques and glaze surfaces. She has taught at all levels from elementary school through adult at the Evanston Arts Center in Evanston, IL; the Kohler Arts Center in Sheboygan, WI; the Milwaukee Art Museum; the Milwaukee Institute of Art and Design; and the University of Wisconsin-Milwaukee.